Rana Zakerzadeh, Will Zhang, Michael S. Sacks. University of Texas at Austin, Austin, TX, USA. OBJECTIVE: Bioprosthetic heart valves (BHV) durability remains a central issue hindering BHV designs. 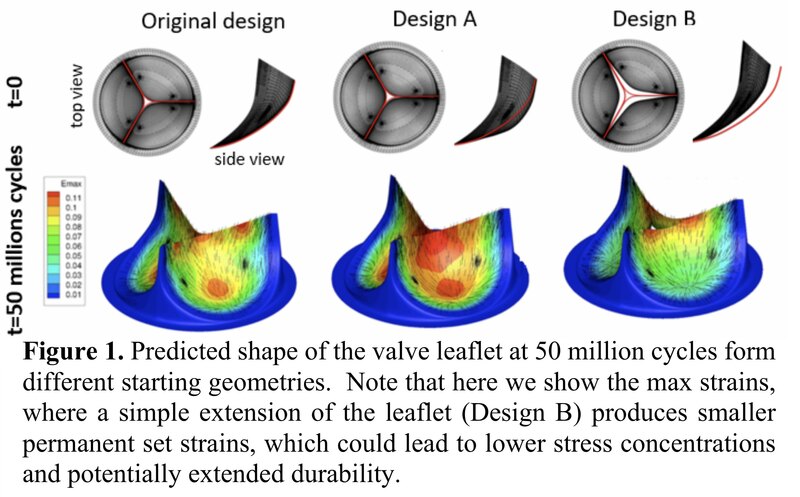 To address this limitation, we have developed a novel, mechanism-based model of BHV responses to long-term valve operation via a permanent set mechanism to predict the evolving geometry, microstructural and material property changes. Methods: Simulations were conducted using the Edwards Perimount valve geometry and collagen ﬁber distributions aligned with the circumference direction with the standard deviation of 30◦. There are four main stages in simulating permanent set: 1) modeling the initial state geometry, material properties and collage fiber architecture, 2) simulation of the BHV using finite element method under physiological transvalvular pressure, 3) updating the material properties for the next time step, and 4) updating the BHV geometry for the next time step. Steps 2-4 are repeated for each subsequent time step until we reach the prechosen maximum number of cardiac cycles.Results: The key result here is that permanent set slows done after 20 million cycles and nearly completely seizes after 50 million cycles (Figure 1). Because collagen ﬁbers have high rates of failure after being extended by 7-8%, more evenly distributing the stresses can reduce this mode of failure. We also note that the regions that undergo most permanent were also were the most common regions of failure. Due to the change in reference conﬁguration, the collagen ﬁbers in these regions recruit more quickly and may even held in a constant extended state. Conclusions: By optimizing the initial BHV design so that the peak stress is minimal in the conﬁguration after permanent set has seized, we can potentially improve the durability of BHVs by minimizing the load on the collagen fibers.